My philosophy is to follow the student. We begin by discussing what interests each individual student may have. We talk about what we will need to research to begin the process of creating. Drawing is usually the point of all beginnings but doesn't have to be. 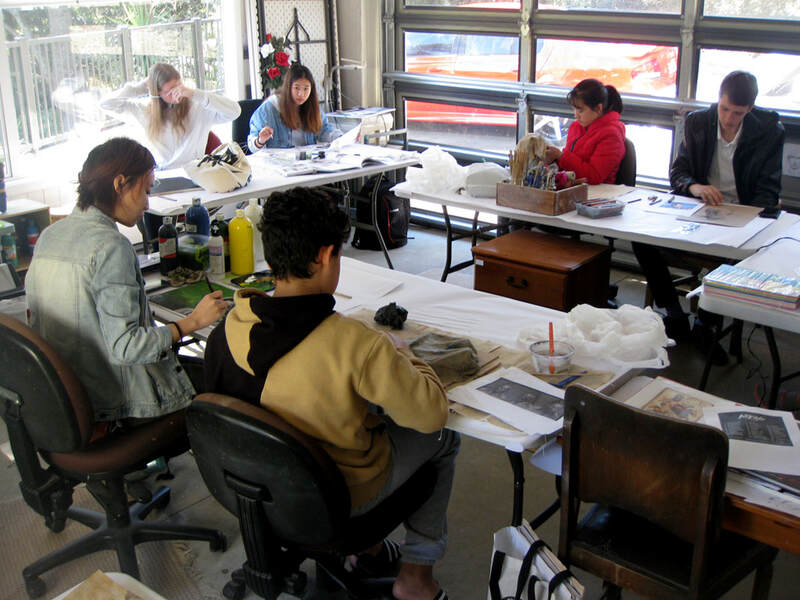 The student can then branch out into other disciplines such as painting, mixed media or sculpture depending on which mediums they would like to explore or what their subject dictates. Your tutor will demonstrate the techniques you will need to employ throughout your chosen project. There will be a mix of tutor directed and student initiated learning. Drawing - Traditional and contemporary drawing exercises, character development, cartoons, children's book Illustration, perspective drawing, ink and wash, portraiture, landscapes, still-life, abstract... etc, etc. ​Using all sorts of drawing tools. This course is also ideal for college-age students who need help with their Art-boards and to create and accumulate work for University Portfolios. (Casual classes are available at a slightly higher rate, see below). Running for: 8 weeks, 1.5 hrs per class. Phone Megan to make a time to meet and discuss either you or your child's artistic goals. Look forward to hearing from you. (Minimum number of 3 students required for a course to go ahead). A material list is given out at the first class or at the first meeting. ​Bring a pencil & rubber on the first day. (The above start dates are a guide only, as students can begin any time throughout the school terms. Fees are adjusted to suite if half way into the term). We will explore a number of different drawing exercises using a variety of materials. These classes fill up fast so get in quick! Casual lessons - $35.00 per 1.5 hr class. when a whole term course is not possible but help is still needed. or specific drawing/painting exercises designed to your needs, etc. Up to you! Please phone and we can plan something together. All courses are GST inclusive. Payment can be made by cash or online payment. Course payments are to be made in full before or on the first day of the course or by prior arrangement. If a class is missed during the term, students are able to attend one of the other class times during that term to catch up. If a student is unable to do this it will have to be forfeited.